There is a grand tradition in the world of traditional rock music that carried on into its many metallic offshoots: the concept album. A set of songs that work together to tell a single but not always focused story and a real way to get many vocalists involved in what are often very instrumental-focused forms of expression. It can be the best of all worlds (Metropolis II, Crack The Skye) and can also be the worst (The Astonishing) and the reasons for those are as varied as the myriad influences that go into them. For The Great Adventure and Neal Morse and crew the story is no different. A concept album sequel to a concept album (2016’s The Similitude of A Dream), it means for those familiar with that album know exactly what to expect here and won’t be taken by surprise with what is found. For newcomers, the sonic underpinnings run the gamut of classic rock (progressive and otherwise): Yes, Pink Floyd, Queen, Kansas, The Beatles, and ELP, among countless others. “Overture” opens with the lines and music that closed out The Similitude of A Dream and The Great Adventure, creating an inherent link that continues to build throughout its playtime. The musical motifs, melodies, even basic ideas (to say nothing of structure) are shared between the two albums. But where The Similitude of A Dream played semi-close to its source material, the first half of Christian allegorical work The Pilgrim’s Progress, The Great Adventure follows a similar journey inspired by but not drawn from the same source material. A son of the original protagonist has to deal with the aftermath of his sudden departure and the void it left behind, a not uncommon story in this or any other age: that of those left behind. The original protagonist’s miseries have largely finished but for our character in The Great Adventure, they’re just beginning. And it’s burly. Across two parts and almost two hours, it’s a journey to remember. There are twenty two songs spread across five parts and many of them can be approached as more traditional songs, particularly like “Welcome To The World” and “Welcome To The World 2”. Really though the album is best approached with the long-form concept in mind, with many of the smaller tracks like “The Dream Isn’t Over”, “Hey Ho let’s Go”, and “Child Of Wonder” serving the larger movements. 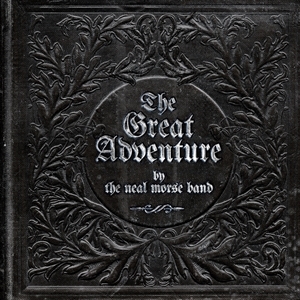 This is a place where The Great Adventure does differ significantly from its predecessor and instead shares much more in common structurally with Neal and drummer Mike Portnoy’s other epic progressive group Transatlantic. Across all of those movements some features remain constant: the album sounds amazing. Every keyboard flourish, every guitar solo, every use of multi-part vocal harmonies (with four revolving lead vocalists, including Portnoy) is clear and impactful. For lack of a better word, it’s magical. Neal Morse and guitarist Eric Gillette continue to carry the majority of lead vocal duties though there are plenty of times where the aforementioned Portnoy and keyboardist Eric Hubauer (each with distinct voices) do shine through often. Though he is rarely a vocal presence, it could not go without mentioning bassist Randy George as he’s an integral part of the process and an unmistakable part of the sound. Volumes could be and have been written on the series of life events that have brought Neal Morse to this point so I’m not going to cover that here. With that said The Great Adventure, more so than its predecessor, is a creation and expression that transcends any particular background or anchoring to a particular faith. The themes at play, their expression, and their resolution, are likely to resonate regardless of whether you carry a religious affinity. The struggles at play across the journey across The Great Adventure are universal. All of it is delivered in a bright, clean manner. The songwriting here isn’t outside the usual for Mr. Morse, at least not in comparison to his other progressive projects. The musical journey, at least, continues to be in using familiar musical textures and with nods to the ‘classic’ bands mentioned earlier and twisting them toward new ends. Metal, at least occasionally, does pop up though there should be no expectation of trying to dethrone Dream Theater and the crossroads they (among others) occupy. No, this is decidedly a progressive rock feature, a feast of the familiar and exotic alike. So an end nears. There is a great joy in having an album of the breadth and depth of The Great Adventure being released at the beginning of a year as it has ample time to soak in and reveal its many nuances and secrets. If you’re the least bit inclined toward the classic or the progressive you will find much and more to lose yourself in with The Great Adventure.